TMS effectiveness for depression is clear. But now there are more machines for providing TMS and more protocols. Is deep TMS better than regular TMS? Or is deep TMS just a marketing phrase? A major review article in JAMA Psychiatry updated our understanding of alternatives to the initial protocol for TMS. JAMA Psychiatry is the most prestigious journal in psychiatry, and this review represents the best assessment of the literature on TMS for depression. This review examined 81 studies comparing TMS with sham TMS (placebo) for the treatment of depression. High Frequency (10 Hz) Stimulation of the Left Dorsolateral Prefrontal Cortex (DLPFC). This is the original approach to TMS that was approved for use to treat major depression by the FDA based on an application by Neuronetics for the Neurostar device. Low Frequency (1 Hz) Stimulation of the Right DLPFC. This is an alternative that was developed based on the observation that right and left sided stimulation had somewhat opposing effects and low and high frequency stimulation also had somewhat opposing effects, so LF right sided stimulation should have somewhat similar effects to HF left sided stimulation. LF stimulation has most often been studied as an approach to treating “anxious depression” and anxiety (see separate post on the topic of TMS for anxiety). Bilateral Stimulation. HF Left DLPFC and then LF Right DLPFC in one session. Deep or H coil TMS. 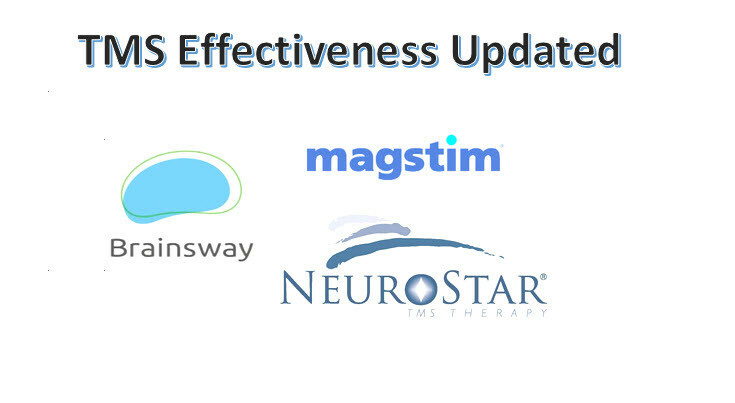 The Brainsway TMS device was approved by the FDA with a more abbreviated review based on a finding that it was substantially similar to the Neuronetics device. This is the most sophisticated article to examine how this approach compares in effectiveness in the treatment of major depression. Theta Burst Stimulation. There are two protocols that have been developed to shorten treatment duration and perhaps increase the stimulation of neuroplasticity. Low-Field Synchronized TMS. Timing stimulation to the person’s alpha frequency. Priming TMS. Delivering high frequency TMS before low frequency TMS to try to boost LF TMS effectiveness. Most of the 81 studies recruited only patients with treatment resistant depression and used TMS as an “add-on” therapy. The authors used two methods for comparing the effectiveness of treatments. One was to directly examine comparisons contained in the studies. The other used network analysis to compare across clinical trials. The network analysis odds ratios of remission or response and the confidence intervals are graphed below. Network Analysis Odds Ratios of Active Treatment to Sham Treatment. CI refers to Confidence Interval and PrI to Predictive Interval. The interventions more effective than sham were priming low-frequency (OR, 4.66; 95% CI, 1.70-12.77), bilateral (OR, 3.96; 95% CI, 2.37-6.60), high-frequency (OR, 3.07; 95% CI, 2.24-4.21), θ-burst stimulation (OR, 2.54; 95% CI, 1.07-6.05), and low-frequency (OR, 2.37; 95% CI, 1.52-3.68) rTMS. Novel rTMS interventions (accelerated, synchronized, and deep rTMS) were not more effective than sham. This study suggests that the evidence is still not adequate to support the routine use of some of the newer TMS techniques, such as Brainsway’s Deep TMS. Brunoni AR, Chaimani A, Moffa AH, Razza LB, Gattaz WF, Daskalakis ZJ, Carvalho AF. Repetitive Transcranial Magnetic Stimulation for the Acute Treatment of Major Depressive Episodes: A Systematic Review With Network Meta-analysis. JAMA Psychiatry. 2017 Feb 1;74(2):143-152. doi: 10.1001/jamapsychiatry.2016.3644. PubMed PMID: 28030740.